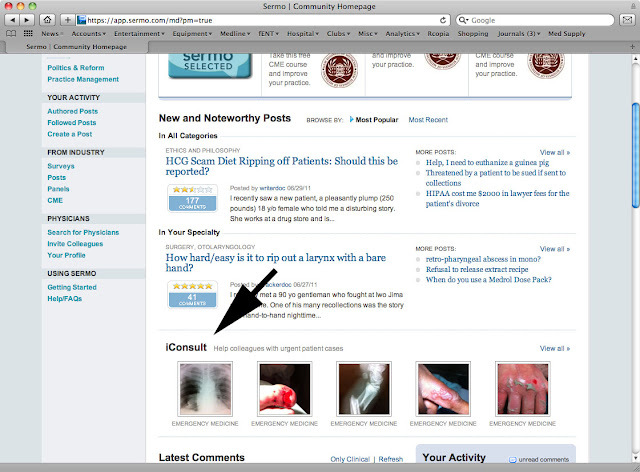 Sermo is an online physician-only forum where doctors ask other doctors for advice. It's where we post particularly thorny/difficult medical issues we encounter in our patients (no patient identifiers of course) and pick the brains of thousands of other doctors across many different specialties throughout the Unites States for assistance. For example, as an ENT, I can post a particularly unusual patient presentation that has me stumped... for example a weird rash on the face... and post it on Sermo. Hopefully, I would than get responses from not only other ENTs across the United States but also input from dermatologists, pathologists, internal medicine, pediatrics, etc. This kind of multi-brain access has been invaluable, especially since being a solo ENT, I do not have the benefit of having a colleague to easily bounce questions off of. Until recently, no iPhone app was available to access this forum... until now. Mind you, only physicians are allowed access. I am fortunate to be one of the first to test out this new iPhone app when Sermo contacted me last month regarding my interest (which I was) and here are my initial impressions when the app was released July 5, 2011. Overall, it is a functional app that is usable in all the ways I would use it on the desktop. The homepage is where theoretically, all the most popular destinations on Sermo is shown. Among the homepage buttons is "Followed" which are postings that I either am following or actively participating in. It would also be nice if there's a button to direct me to my specialty postings rather than clicking on "Posts" (which lists all postings in chronological order) or "Popular" (which lists the most popular postings in terms of activity) and than selecting "Specialty" which is the 2nd most common destination for me. "History" lists all postings or messages that I recently visited. Adding a new posting appears to be fairly straightforward with two options... One which is triggered by taking a picture (iConsult) of an abnormality (like a CT scan or a rash) as well as one without the need for a picture (Create Post). The iConsult button is a leap forward better than what the desktop can offer. With iConsult, I can use the iPhone to take a picture, add a brief background history, and post whereas with the desktop, you would have to take a picture, transfer to the computer, logon to Sermo, and add the photo manually when creating a new post. The iConsult has resulted in the addition of a new section on Sermo... when I last checked, there's already been 5 postings to this section. With any postings, I can add a comment easily or view a brief bio by selecting on the commenter's user handle. All in all, a great free app currently available for the iPhone only.